ILTF publications are outlined below. The updated American Indian History Timeline illustrates events, policies, legislation and laws relating to Indian land tenure from 1598 to the present. Suitable for hanging on a wall, the timeline was recently redesigned to make it easier to read. It measures 24″ x 55″ inches and can be purchased at a cost of $5 each, plus shipping. Discounts are available on orders of five or more. To order a timeline, please email info@iltf.org or call 651-766-8999. 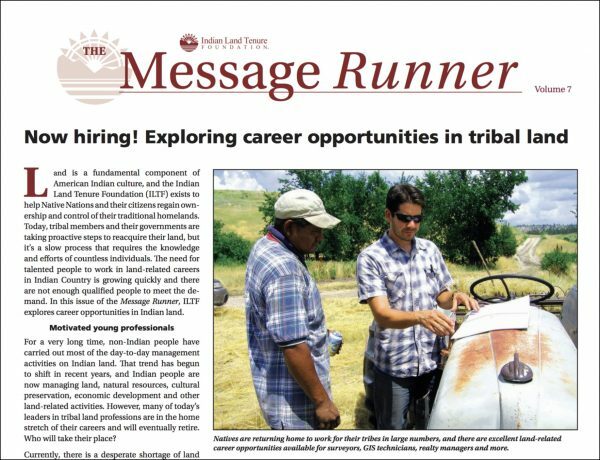 Message Runner is an educational publication produced by ILTF to address specific topics related to Indian land tenure. Past issues have been widely distributed throughout Indian Country and have been used by colleges and universities, tribes and federal agencies for education and training purposes. ILTF offers the Message Runner free to individuals, nonprofit organizations and tribes. Charges may apply for larger quantities. Contact ILTF to order paper copies. Click the volume number of each issue below to see a pdf version of the publication. “Cutting through the Red Tape: An Indian Landowner’s Guide to Reading and Processing Federal Forms.” A collection of federal forms used in the management of Indian lands and assets and explanations about how to read and process the forms. “From Removal to Recovery: Land Ownership in Indian Country.” A historical account of Indian land ownership, from pre-contact to the present. Rights of way in Indian Country. A primer on Indian estate planning and probate. An overview of the major Indian land tenure issues. ILTF worked in partnership with the Indian Law Resource Center (indianlaw.org) to develop a set of 17 General Principles of law that create a legal framework to guide the future development of federal law relating to Indian land and resources. The resulting publication, Native Land Law: General Principles of Law Relating to Native Lands and Natural Resources, published by Thomson Reuters, provides a comprehensive overview of the General Principles and an extensive legal analysis of relevant federal law. ILTF has also developed a CLE series offered through West LegalEdcenter, as a companion to the book. Participants will gain a deeper understanding of current law, the historical and legal contexts that shape Native land law, and will be challenged to consider alternative approaches that are workable within a U.S. constitutional framework. Trainings are fully accredited and provided online through Thomson Reuters West LegalEdcenter. To register for an upcoming training, or to view previously aired programs On Demand, click on the active link for each CLE below. David Freeman and Cris Stainbrook will provide introductory remarks, including an overview of the Cobell v. Jewell (ultimately, Cobell v. Salazar) class action lawsuit, as well as an overview of the legal framework, administrative structure and regulatory instruments for effective land stewardship in Indian Country. Plaintiffs’ attorneys Dennis Gingold and Alexander Pearl will provide their perspectives on litigating the class action suit, from cause of action to strategic considerations throughout the more than decade-long case. Pearl will discuss the strategy for guiding the settlement through Congress for approval. Former clerk to Chief Judge Royce Lamberth, who presided over the Cobell v. Jewell lawsuit for several years, will provide his perspective on the class action lawsuit, including an overview of the several rulings that came down under Judge Lamberth and the tactics employed by attorneys on both sides over the course of the case. Pursley will discuss the implications of Cobell on the public trust in the federal government and ways in which the judiciary can be a vehicle for restoring public trust. Stacy Leeds and Ed Gehres will provide an overview of federal trust responsibilities to Indian tribes and individual Indian people as well as the impacts to the trust relationship resulting from the settlement of the Cobell lawsuit. Kevin Washburn will provide insight into the impacts of Cobell within the Department of the Interior, which oversees the Bureau of Indian Affairs and is charged with implementing the Buy-Back Program for Tribal Nations, a major component of the settlement of the case. Gain a better understanding of the impacts of the Cobell case and settlement for federal agencies. Listen as our speakers explore nature of the erosion of public trust in the government and the implications that this erosion of trust has on the ability of the government to carry out its responsibilities. The following series offers continuing legal education (CLE) credits from the perspective of tribal land staff. These sessions were offered live at the 4th Tribal Land Staff National Conference in April 2014. Click on the title link for access to each CLE. Native Land Law is a continuing legal education (CLE) series for legal professionals, tribal leaders and others interested in Indian law. The series offers CLE credits and training for legal professionals, tribal leaders and others interested in federal Indian law. 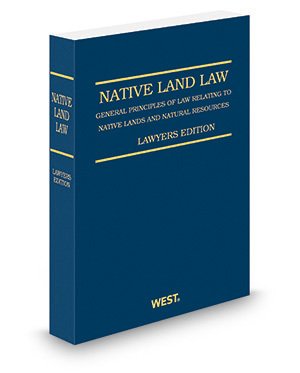 It provides an overview of the 17 legal principles in Native Land Law: General Principles of Law Relating to Native Lands and Natural Resources and offers analysis of federal laws and policies that impact the field of Indian law today. For more information on CLEs, please email Nichlas Emmons. 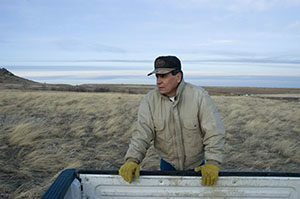 This section includes useful information for all Indian landowners and tribes who want to learn more about managing their trust land and assets. We will continue to update these materials as more resources become available. Based on Message Runner, Vol. 5 “Cutting through the Red Tape” is a collection of federal forms used in the management of Indian lands and assets. Each page includes general information about the topic, helpful tips about how to read or process the relevant form, and where to go for help. Contact information and links with useful information on a range of topics related to Indian land ownership and management. Your Guide to FSA Farm Loans (June 2012) Includes resources and information specific to producers using American Indian trust land. Federally Recognized Tribal Extension Program (FRTEP) paper – Learn more about tribal community outreach focused on agricultural productivity, youth development and healthier communities. Swanson, Drobnick & Tousey P.C. Reprinted from the July/August 2012 issue of Right of Way Magazine. Permission to publish granted by the International Right of Way Association (irwaonline.org). 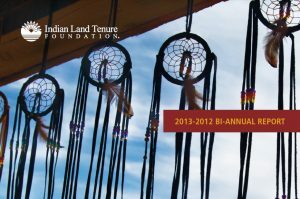 The Indian Land Tenure Foundation provides free Indian land tenure curriculum for all educational levels. Has specific state adaptations for California, Minnesota and Montana. 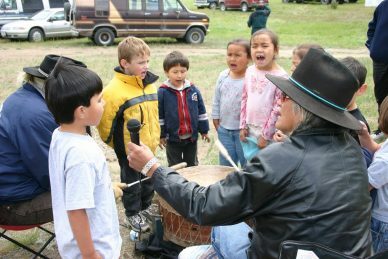 In addition to state adaptations there are general lessons which can be used to teach Native Land Tenure History anywhere in the U.S.A. Learn more about ILTF’s work since 2002 by reading past Annual Reports. General information on land use planning for Indian allottees as well as GIS-based land maps for Pine Ridge landowners to use for individual and tribal land planning purposes. Developed by Village Earth, with a grant from the Indian Land Tenure Foundation. An analysis of the BIA’s Indian Land Consolidation Pilot Program, which began in 1999, as a result of Congressional Acts and Supreme Court decisions that sought to remedy problems associated with fractionated ownership of Indian land title. A report by Indian Land Tenure Foundation to the Bureau of Indian Affairs and the Office of the Special Trustee for American Indians. Winning entries from Native Women and Youth in Agriculture’s annual student essay contest. The second community survey conducted by ILTF examines landownership and estate planning among Indian people. The first community survey conducted by ILTF about the importance of land and the value of property rights. ILTF publishes quarterly updates about our projects, initiatives and people. Read the July 2017 program update: ILTF helps land recovery efforts at Bear Butte.